Rašome apie veganišką maistą, mitybą ir gyvenimo būdą nuo 2012-ųjų! From January 2015 a new law came into power: all the ingredients in labels should be easy to read, all the allergenes must be written in bold or clearly distinguished in any other way. 1. 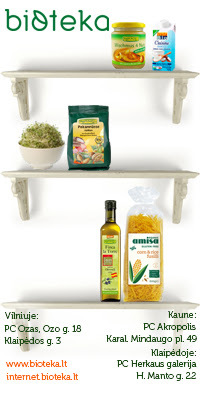 Check our list for vegan products in supermarkets. 2. Check bioshops (Bioteka, Livinn, Tikrai Be, Biosala) - they usually have proper markings of vegan products - or Veggo - our only vegan shop in whole country. 3. RIMI supermarkets (HyperRimi) usually have vegetarian section. 1. Check our list of vegetarian, raw and veg-friendly restaurants. 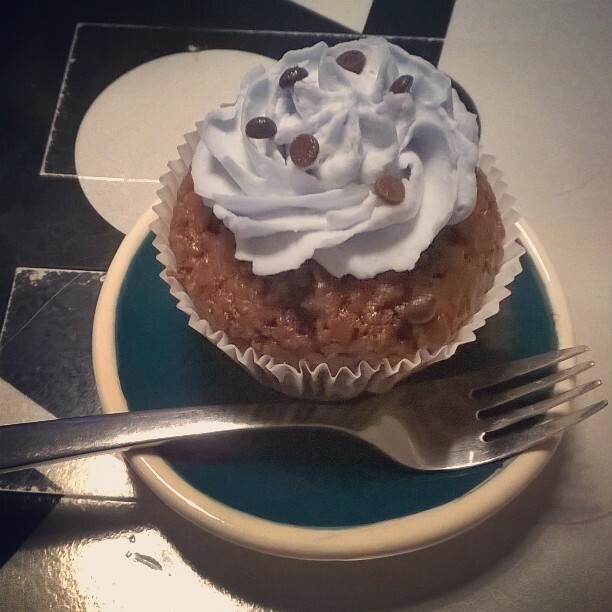 „Chaika“, Totorių g. 7, Vilnius - best vegan cupcakes in the whole country! Vegan sandwiches, various coffees with soymilk are also available. „Moksha“, Vasario 16-osios g. 6, Kaunas - many vegan options, great quality food, nice environment. 2. Look for a sticker saying "Vegan friendly". Ar yra pieno ar pieno produktų? - does it contain milk or milk products? Ar yra mėsos? - does it contain meat? Ar yra kiaušinių? - does it contain eggs? You can always cheat and say that you are allergic to something. There were some cases, like, when you ask whether a product contains milk and the wait(er/ress) says that it does not. Then you say that you are allergic to milk, and then they say that actually the product contains milk... So be aware! Sadly, Lithuanian cusine is not vegan friendly. 1. Try Arbatinė in Kaunas, they make a lot of national dishes (vegan versions). 2. Try Bernelių užeiga for cepelinai - order those with mushrooms (su grybais) and ask to bring it without sauce (be padažo) since the sauce is made of cracklings. 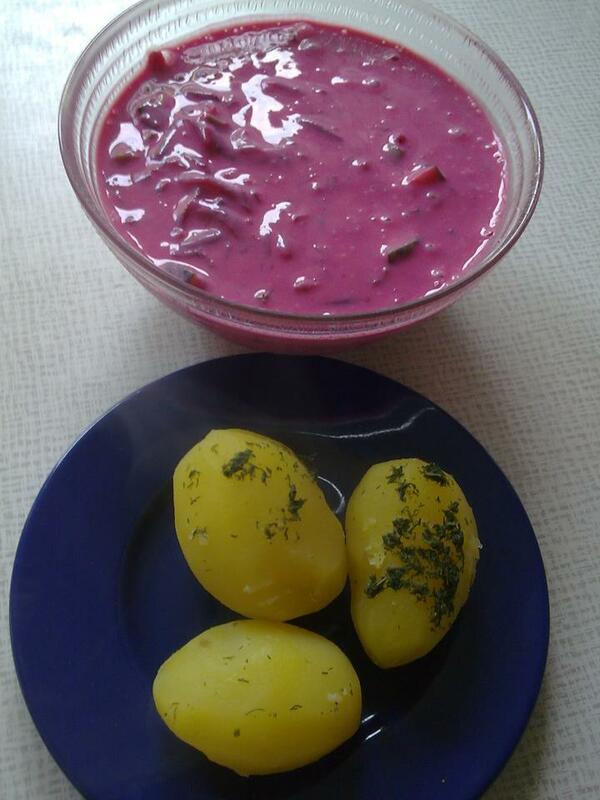 Or you can make some vegan-ised Lithuanian food by yourself! Cut cucumber in small pieces, chop onions and dill. Add pickled beet (liquid as well) to a big bowl, then add soy yogurt, soymilk, cucumber, greens (and tofu - if used) and salt. Mix it all. Serve with hot boiled potatoes. Cepelinai is much more difficult to prepare and requires a lot of time and patience. First, you need to prepare the potato mass. Take 1/4 of potatoes (500 g from 2 kg), peel and boil it. Grate the rest of potatoes with a food processor (it should look like this and not like this), remove the liquid. 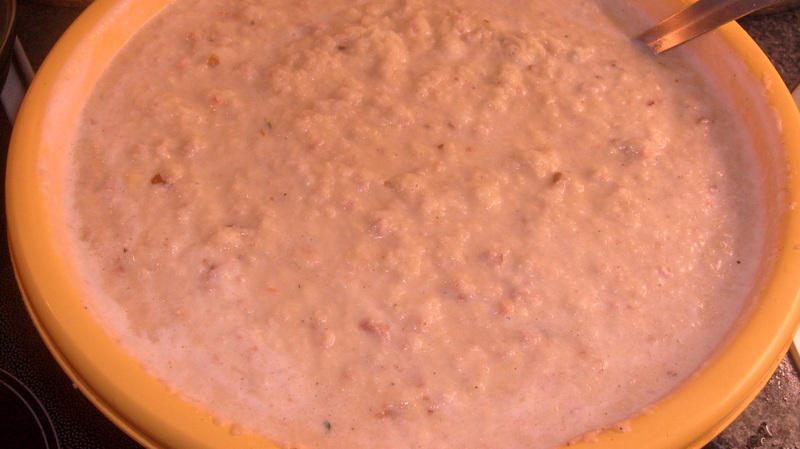 Mash the boiled potatoes and mix it together with the raw mass. Add a pinch of salt. Mix it. The mass should be stable enough and stick well to form cepelinai. 1. For tofu - cut the onion and fry it with some oil in a pan. Mash tofu, mix with onions, salt and pepper. 2. For soymeat - mix dry soy with spices and salt, add some boiling water and allow it to soak. Remove the liquid. Cut the onion and fry in the pan with some oil. Mix it with soy, add some salt, spices and starch or powdered flax seeds so the mass sticks together. 3. For mushroom - cut the mushrooms, cut the onion and fry everything in the pan. Add some spices. Then add some starch or powdered flax seeds so the mass sticks together. Form cepelinai: take a piece of potato mass, form a flat round "pancake". 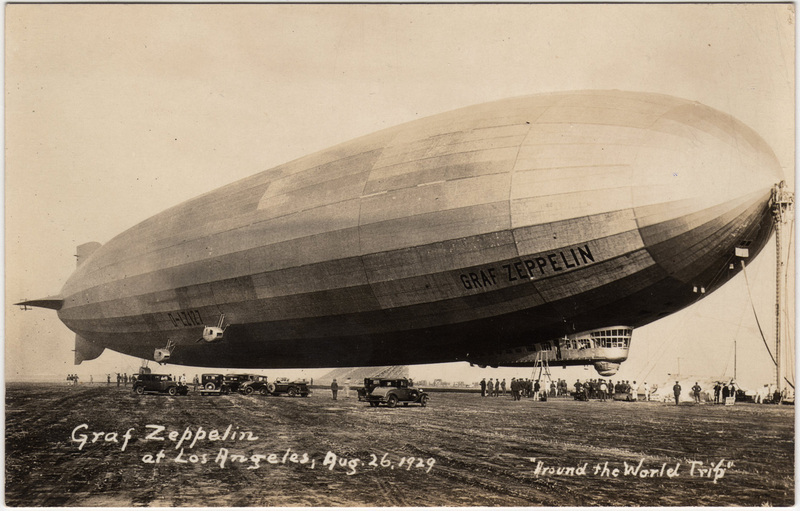 Add some filling in the middle and close it up to the shape of famous Graf Zeppelin. Add water and the leftover liquid from potato mass to a big pot. Add some salt. Bring it to boiling temperature. It should get thicker. If it does not, add more starch (mix with a bit of cold water so it won't get lumpy). Carefully add cepelinai into boiling water and boil for ~30 minutes. Serve with soycream, oil-fried onions or any other sauce. Boil a big pot full of water. Remove first upper leaves from a cabbage. Try to cut out the heart of a cabbage (just to not cut the head in half!). Add a pinch of salt and a cabbage to a boiling water. Boil it covered for 5 minutes, then turn off the heat and put it away. Prepare the filling: boil the rice. Mix dry soymeat with spices, add some boiling water and left it to soak. Cut the onion, grate the carrot. Fry vegetables in a pan with oil. Remove the water from soy, add fried vegetables, oats, rice and more spices and salt. Mix it well. Take out the cabbage and start removing the leaves, one by one. 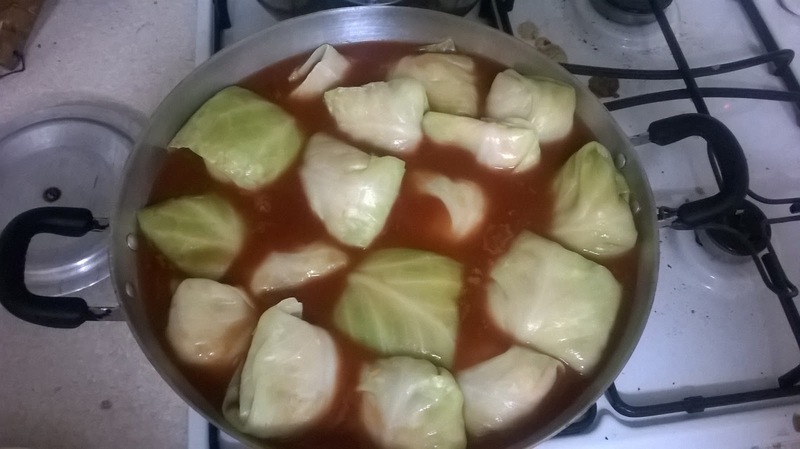 If the leaves are hard to remove later, boil the rest of the cabbage for 5 minutes again. Cut the hard part from the bottom of the leaf. Add some filling (form it in a small roll) and fold it together. Layer all balandėliai in a pot. Add tomato paste, salt, broth and hot water, so they are covered. Braise on a small heat for ~30 minutes. Serve with boiled potatoes. Veganas - žmogus, sąmoningai, dėl etinių priežasčių atsisakantis vartoti gyvūninės kilmės produktus. 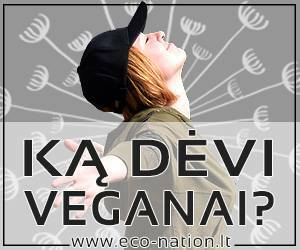 Veganai nevalgo mėsos, žuvies, kiaušinių, pieno produktų, medaus, želatinos ir t.t. Veganai nedėvi drabužių iš kailio, odos, vilnos, šilko. Rašai apie veganizmą? Pasigirk! Patalpinsim tavo nuorodą čia!